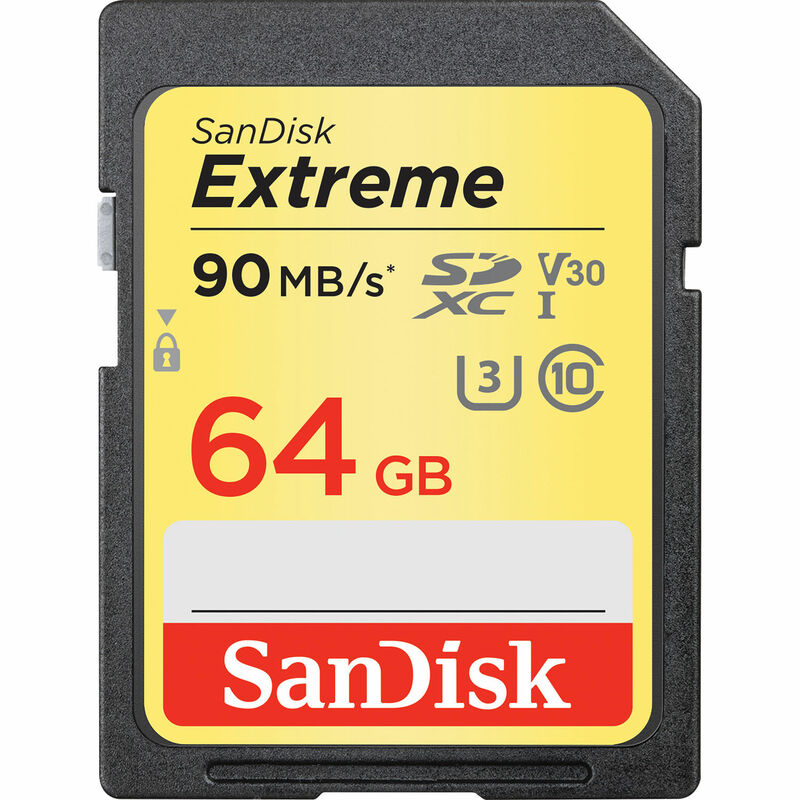 Built to meet the demands of photographers and passionate shutterbugs who are using advanced cameras and HD camcorders, the 64GB Extreme UHS-I SDXC Memory Card from SanDisk allows users to take advantage of functions such as fast action shots, continuous burst mode, and multiple frames per second. It features a capacity of 64GB, is compatible with the UHS-I bus, and delivers maximum read speeds of up to 90 MB/s and maximum write speeds of up to 40 MB/s. This Extreme UHS-I SDXC card supports the V30 speed class, which guarantees minimum write speeds of 30 MB/s. If your device does not support the V30 speed class, this card also supports the U3 speed class, which likewise guarantees minimum write speeds of 30 MB/s. If your device only supports the Class 10 standard, minimum write speeds are guaranteed not to drop below 10 MB/s. Built for extreme conditions, SanDisk's 64GB Extreme UHS-I SDXC Memory Card is water, shock, and x-ray proof, while also being able to withstand temperatures from -13 to 185°F, allowing for use in environments such as snow and deserts. A built-in write protect switch further helps to safeguard your content, while advanced Error Correction Code engine offers improved data integrity and card reliability during read and write operations. Downloadable RescuePRO data recovery software helps you restore accidentally deleted images. The card also has a writable label on its surface and the included jewel case makes for easy storage and organization. This card is backed by a limited lifetime warranty. With a capacity of 64GB to capture it all, this SanDisk Extreme UHS-I Card offers enough room for thousands of high-resolution photos. The card can accommodate high-volume image formats, such as RAW and JPEG, and also provides plenty of room for Full HD videos. Designed and tested to withstand the tough conditions, this card has a capacity of 64GB and is waterproof, shockproof, and X-ray proof. It can operate in temperatures ranging from -13 to 185°F, so you can work in almost any climate. 64GB Extreme UHS-I SDXC Memory Card is rated 4.7 out of 5 by 207. Rated 1 out of 5 by Floyd from Defective in my new Nikon D810 I just received my new Nikon D810 in today and it was part of a B&H package deal that, among other things, included this SanDisk SD card. Out of all of the CF and SD cards that I've used since the inception of digital photography, this was the first time that I got an Error message upon inserting any card into any camera. When trying to format it, I got another error message that said the card was defective. I inserted a different, new SanDisk Extreme Pro 64 gb card that I ordered separately and it works fine (so it's not the new camera). Guess I've been lucky all these years. Anyway, will try to get a replacement from B&H. Rated 5 out of 5 by Chris from Very good Memory card This came free with a bundle but is the second fastest I currently own. It has no problems when using high speed continuous shooting mode on Nikon D750 (6.5 fps). I own the 280/mbps version as well, and obviously that one is much faster. But the difference is only noticeable if you are paying close attention. Takes HD video at the same quality as the 280/mbps version on my D750 (1080/60fps). Unless you are professional or have a higher end camera, I would recommend this memory card vs the faster versions to save yourself the money. Rated 5 out of 5 by Phillip from They are genuine My concern when buying memory is to avoid counterfeits, so I bought from a trusted source, B&H. I received the cards very quickly and checked the packaging for telltale signs of counterfeits and found none. I then ran the H2testw application and they checked out good. I then put them in my Sony Alpha A6000, formatted them and started using them. They are very fast, as they should be, and trouble free. Rated 5 out of 5 by Brenda S. from San Disk Loyal When a brand works - you stick with it. Rated 5 out of 5 by N8 from Great SD Card This card is very fast and is capable of taking many burst shots without slowing down. It's a very quality product and seems to be well made, unlike some cheap SD cards I have purchased in the past! I would recommend this SD Card to anyone! Rated 5 out of 5 by Eric from Great SD Card Use this memory card with our Canon 5D Mark IV and it has no issues with keeping up with the high demand placed on it from the camera. Whether taking pictures or shooting video, this card never lags and produces great results! Rated 5 out of 5 by Judith from Top quality. I shoot very often and also require multiple sooting bursts. Great product, as the recording takes the time I need for my semi-professional work. Rated 5 out of 5 by Anonymous from -can never have too much! The SanDisk memory card is wonderful; holds tons of pics & given the extent of my picture taking, memory is never a worry. This card is compatible. All you need for video is the U3 and Class 10 rating. For still photos, the camera will do fine with with the card's max write speed of 40 MB/s. Can this be used with a Canon G9 x? Yes it can be. This Memory Card is compatible with the Canon PowerShot G9 X, B&amp;H #CAPSG9XB. Will this card work with the Panasonic Lumix GX85 camera? Is this card compatible with the Canon T5i ??? Yes, it will work fine in the Canon T5i. For further selection, go to the camera's B&amp;H and look under the Accessories tab. Will this card work in the Sony FS5 if I'm shooting in HD, HFR or 4k xavc at 60MB/s or 100 MB/s? According to the Sony PXW-FS5 XDCAM Super 35 Camera System's instruction manual, SDXC UHS Speed Class (U3) is required to record at 100 Mbps. To record at XAVC QFHD, a Class 10 or U1 or faster card may be used, but you will need a U3 card to record at 100 Mbps. U3 is alwo required for XAVC QFHD(Slow &amp; QuickMotion) and XAVC QFHD/Proxy simultaneous recording. As such, I would recommend the SanDisk 64GB Extreme PRO SDXC UHS-I Memory Card, B&amp;H # SAEPSD64GV3G, for your usage needs, especially considering the small difference in price between the two cards. will this work in my rebel t6? Can this memory card be used in a LUMIX GH3? Is this card compatible with Nikon D5200 DSLR ?